FREE High Speed Internet Access in all guest rooms and public areas..FREE Local Calls.. plus every room has a microwave- mini-fridge- 40 inch flat screen TV- and hairdryer. Irons and ironing boards are available at the front desk upon request. 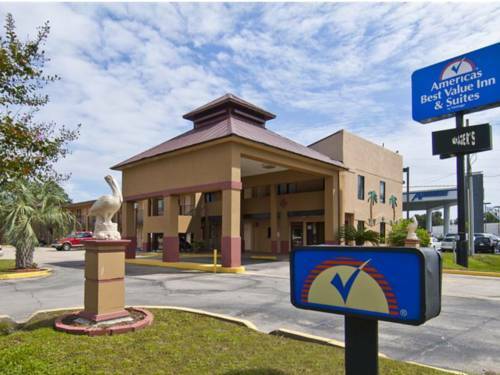 Come visit the Americas Best Value Inn N Suites of Pensacola.. Florida.. conveniently located 1/4 mile south of I-10. Our property is located within minutes of Florida Gulf Coast. While staying at our Inn...enjoy our crystal-clear swimming pool. Fax and copy services are available for business travelers. Come stay at our exterior corridor property in one of our 60 charming guest rooms.. you wont be disappointed by all of our extras. Pets are allowed-restrictions apply. Property is conveniently located 1/4 mile south of I-10 and exit 10A.